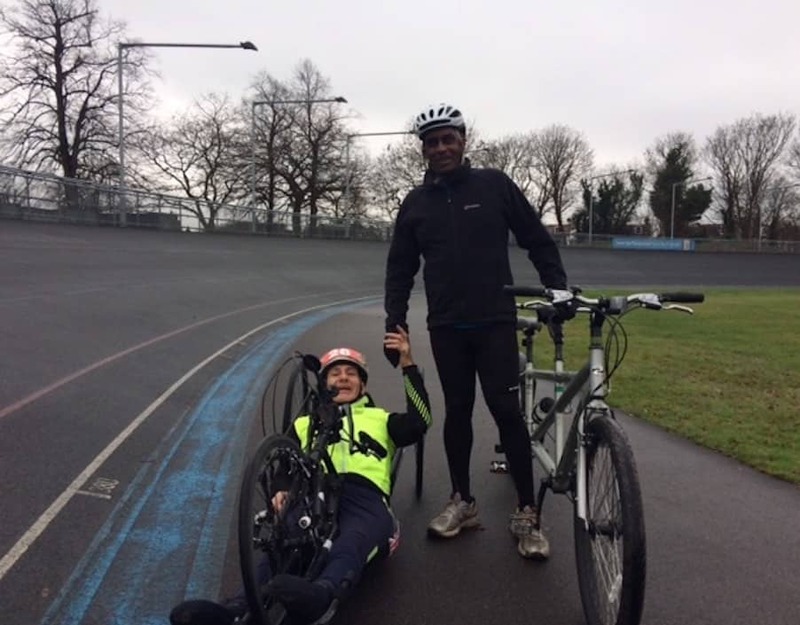 training for two triathlons on a tandem hired from Wheels for Wellbeing, shares his experience of how WfW helped him get back into cycling after losing his sight. Triathlons had always been something I wanted to do when sighted and still a goal after becoming blind. In November 2016 I joined local to me Windrush Triathlon Club and they put me in touch with their former head coach Tony Donaldson. He has been absolutely brilliant putting a lot of his time in helping me to train. Overall, my triathlon training is progressing well and I am entered for two sprint triathlons (750m swim, 20km cycle and 5km run) in May 2017 at Crystal Palace (14th May) and Eton Dorney (21st May). Tony will be my guide on both. I intend to enter a couple of Olympic triathlons later in the summer which are double the lengths of the sprints. As visually impaired, my only option for cycling is on a tandem. When I started training Tony and I had to search around for means of accessing tandem cycling. We were both separately aware of Wheels for Wellbeing as an organisation making cycling accessible for the disabled in south London. I had come across WfW through my contacts in Metro Blind Sport and British Cycling. When WfW told us they had a Dawes mountain bike tandem Tony and I were eager to give it a spin, hence we found ourselves at one of WfW’s sessions at Herne Hill Velodrome on a frosty December day. In fact it was too icy to go on the velodrome track, so we had to make do with cycling inside the track but that was more than enough to sell me and Tony on the tandem. A couple of conversations later and WfW had kindly agreed to allow me to rent the tandem from then for the period up to May. Tandem cycling is a new experience for me. 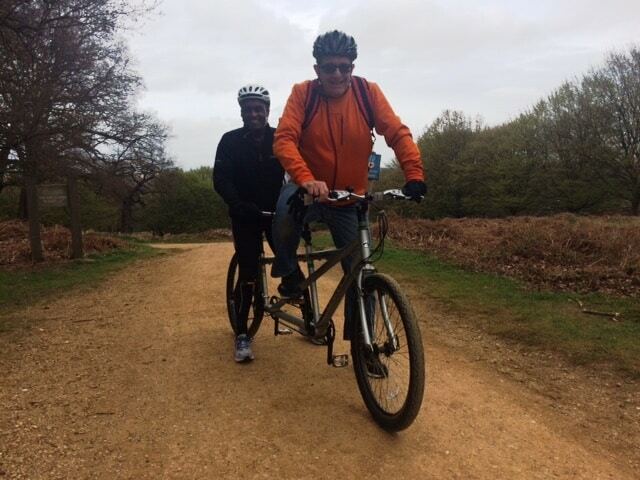 I had done some mountain and road cycling before my sight loss. Afterwards, I had done a lot of spinning, so I knew I was a good solo cyclist. Initially, I found being on the back of a tandem, without being able to see, quite disorientating as it is difficult to know where the tandem is moving, relative to where I’m facing. However, after our first session I quickly relaxed and was happy to put my trust in Tony as the tandem pilot. For his part Tony has been getting to grips with the power, speed and momentum of the tandem. Last year, he had a serious accident and suffered a head trauma, at an event called Hell Of the Ashdown, as Tony likes to joke, he finished it in an air ambulance! Tony has shown great courage and determination in starting to recover from this and get him back in the saddle. Tony and I returned for another three WfW session at the Herne Hill Velodrome each time increasing our confidence and speed, on our last visit in February we completed 20km (38 laps of the Velodrome) in 36 minutes. Practice in the Velodrome is fine for the flat course for the triathlon at Eton Dorney however our first event at Crystal Palace will involve going up and down a significant hill 9 times! With this in mind we have now started taking the tandem for practice rides in Richmond Park which has a couple of big hills. WfW were very accommodating in agreeing to fit a larger chain to the tandem giving us lower gears to tackle steep hills. I think, we can safely say that our tandem cycling has improved significantly since we started with WfW in December. Our technique is better and we are a lot fitter and stronger. In this period I’ve lost over 10kg and Tony assures me he has made similar reductions, so this should help us shift the tandem faster. With just over a month to go, I’m confident we can achieve reasonable times for both triathlons in May. At one of our Herne Hill sessions we met wheelchair athlete Gary Donald who is part of the London Fields Triathlon Club. In a moment of bravado I accepted Gary’s challenge to see who could post the fastest time at Eton at the end of May! Based on Gary’s previous performance this is likely to be at least 1 hour 40 minutes which will be challenging, to say the least, but I’m confident I can get close! The author of this post is Haren Thillainathan. He’s 43 and two years ago he got glaucoma during an eye operation which damaged his optic nerve, taking out 99% of his sight. He’s gradually losing the remaining 1% of his vision due to a corneal condition, which means the surface of his eye is accumulating water. What he “sees” ranges from a deep white fog to raging thick “TV static” with glimpses of light, shadows and colour. However, he’s never been someone to accept any limitations to his ambitions. If he wants to do something, he’ll do it regardless of the challenges. A few months after losing my sight he was back at work and is gradually getting back into his old activities and pursuits as well as new ones, including snowboarding. Do you also have a cycling story to share that you think may encourage more disabled people to cycle? Get in touch with us by emailing info@wheelsforwellbeing.org.uk and we may publish it on our website. Interested in hiring one of our adapted cycles, also write to the above email.